In an effort to speed up the game, Double-A and Triple-A teams were notified on Wednesday that pitch clocks will be installed and used for the upcoming season. Minor League Baseball president Pat O’Conner confirmed that each ballpark amongst the upper levels will have three clocks installed with two behind home plate and a third in the outfield. 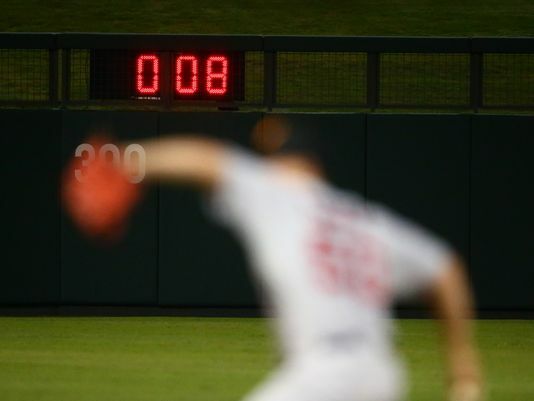 The 20-second pitch clocks were one component of the numerous pace of play initiatives Major League Baseball implemented this past fall in the Arizona Fall League. Although specifics over what will all be included in the new rules for 2015 are yet to be determined, other regulations used in the AFL dealt with a timed break between innings, limiting the number of manager visits to the mound, and restricting batters to remain in the batter’s box. Why isn’t the biggest problem in pace of play at the MLB level being addressed? Everyone knows the biggest contributor to the long games are the frequency and length of commercial breaks. But I wouldn’t hold my breath over MLB killing that cash cow any time soon. Why can’t the ways to speed up the game outside of the actual game be exhausted before we change anything between the white lines? I have no idea. At this rate, it’s only a matter of time before a courtesy runner for the catcher becomes mandatory. How will the pitch clocks actually work? Your guess is as good as mine. In the press release for the Arizona Fall League, it stated “beginning the motion of coming to the set position shall be sufficient to stop the clock.” However, that wasn’t true at all. If a pitcher did not actually start his motion home (or a pickoff attempt) within the 20 seconds, the umpire assessed him a ball. Now imagine a runner or runners on base knowing full well that a pitcher can’t really use the “step off” or hold the ball to throw off timing anymore. In fact, smart baserunners can anticipate the 20 second clock like a linebacker jumping the line if he knows the snap count. Why is this being implemented at only the AA and AAA levels? If MLB was interested in the long play they should implement these rules at the rookie-level and gradually expand it over the next five years up the various levels of minors. That way players who move up the chain will already be familiar with the rules instead of a constant re-programming of their tendencies at Double-A. The only reason I can come up with is that MLB plans to push this for implementation in the major leagues in 2016 and needs to educate the next wave of rookies this year. How many sides of their mouth is baseball talking out of? Too many to keep track of. In one breath they are claiming poverty against the evils of minor leaguers seeking a fair wage and in the next they are requiring teams to incur new costs for these pitch clocks. Although the physical clocks and their installation will be covered by MLB, minor league teams are being forced to cover the cost of a full-time operator who needs to attend seminars and educational instruction. That already creates a bigger fiscal impact on minor league teams than any outcome of the class action lawsuits filed by former players would. But don’t tell that to MiLB VP Stan Brand who urged his minions to “heed the clarion call (and) man the battle stations.” He believes that the lawsuits endanger the “future of minor league baseball and their communities investments in stadia and infrastructure” despite costing actual MiLB teams NOTHING (since player salaries and benefits are completely covered by the major league organizations). This entry was posted in Uncategorized and tagged Arizona Fall League, pace of play, pitch clock. Bookmark the permalink.